This section isn't a botany lesson. The reason you need to know plant parts when you're planning a garden is that it will help you choose plants with flowers and foliage that complement each other from a design perspective, and it will help you foresee challenges such as trying to plant under trees with shallow roots. Color: Like beauty, color is in the eye of the beholder. Foliage described as black is often dark maroon, for example. (Plant breeders take license when naming new varieties, so try to find photos or live samples.) Variegated foliage has leaves with two or more colors in them. Size: Look for actual measurements if leaf size is a concern. Shape: Most descriptions use everyday language, but you may run across botanical terms such as ovate (egg-shaped), lanceolate (lancelike), and cordate (heart-shaped). 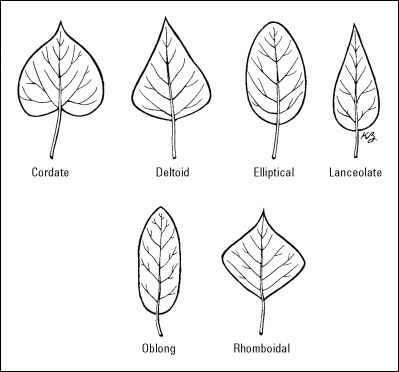 Figure 3-1 shows some common leaf shapes. Surface texture: Leaves can be shiny and smooth, hairy, fuzzy, or wrinkled. Knowing what a plant's flowers look like can help you find the most complementary place for the plant in your garden. Some plants, like most daffodils, have single flowers, which come one to a stem. 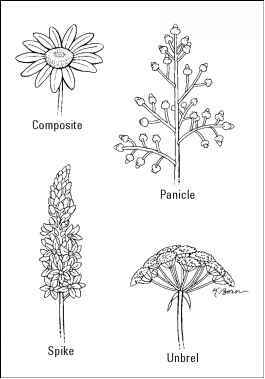 Others produce clusters of flowers in a wide array of shapes (a variety of which are shown in Figure 3-2). Fibrous roots are finely branched and grow close to the soil surface. Plants with fibrous roots are easy to transplant and divide into new plants, but are more easily damaged by drought and cold weather. Taproots usually are thick and long, reaching deep into the soil. After they're established, taproots are difficult to move, but they tolerate temporary drought. Some plants, such as clematis, have particularly shallow root systems that are easily damaged by cultivation, so use extra caution when weeding around them. Maple trees have extensive surface roots, making it a challenge to grow plants underneath them. What are shallow rooted plants? What kind of vine has heart shaped leaves?